Almost 60 ACORN members came out from across the city to fight for affordable housing in the recently re-organized St. Jamestown chapter. Members were protesting against a new 50 story development which include exactly 17 affordable units, and no affordable housing otherwise. 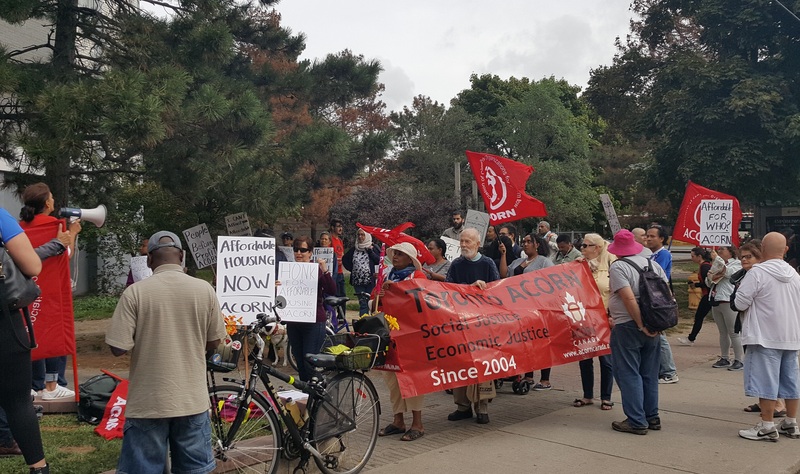 ACORN was there to make their demands clear to the city: redefine 'affordable' to be based on income to match the realities of low income people and create inclusionary zoning bylaws to require new developments to set aside 30% of all units as deeply affordable. The action was tied in to local demands from the new members in the area. Over 1500 people had recently been displaced by a 6 alarm apartment fire, and had been living in shelters for weeks. The developer of the 50 story tower owned the building members had been displaced from, as well as other buildings in the neighbourhood where repairs were slow, shoddy or non existent. Members had letters prepared for the property owner, Bleeman Holdings, as well as the current mayor John Tory. 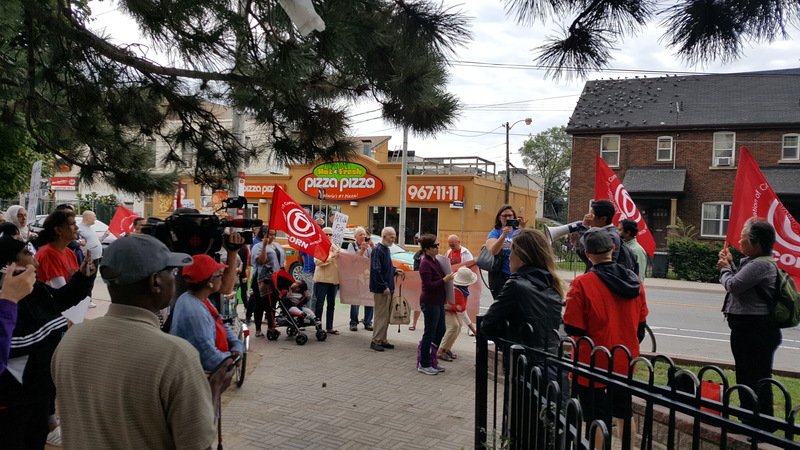 We were joined by local city council candidate Kristyn Wong-Tam who at the action reported that somewhat miraculously 35 vacant units had been found in a building close by which was owned by the landlord. Seems like the city had dropped the ball communicating this fact, or the landlord panicked and threw the mayor under the bus. Either way, we'll take a victory and keep on fighting. 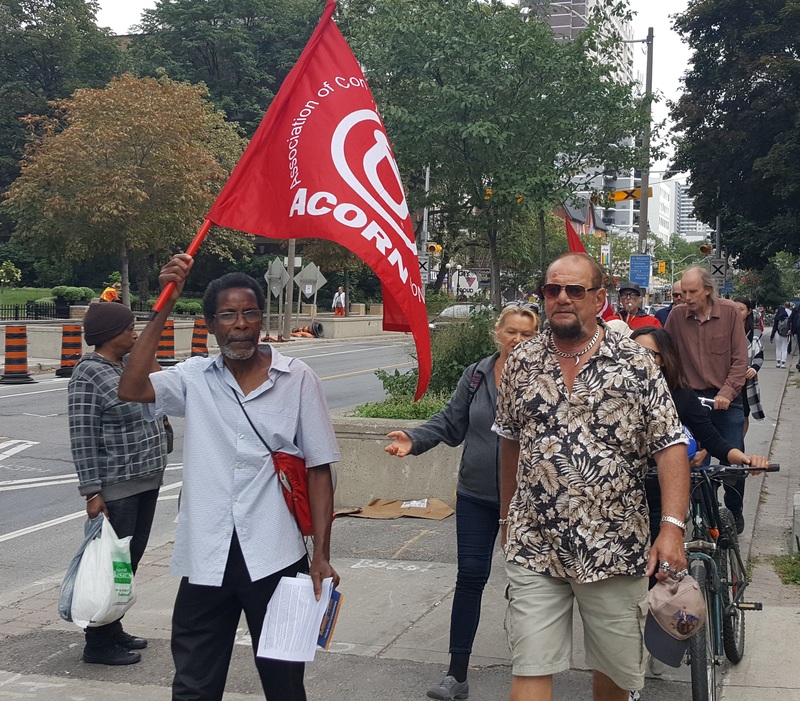 After declaring this a small victory, 25 ACORN members marched down to City Hall to deliver a letter to John Tory to demand that he get all remaining displaced tenants housed, force the landlord to fix their other buildings and commit to ACORN's city wide demands for real affordable housing.